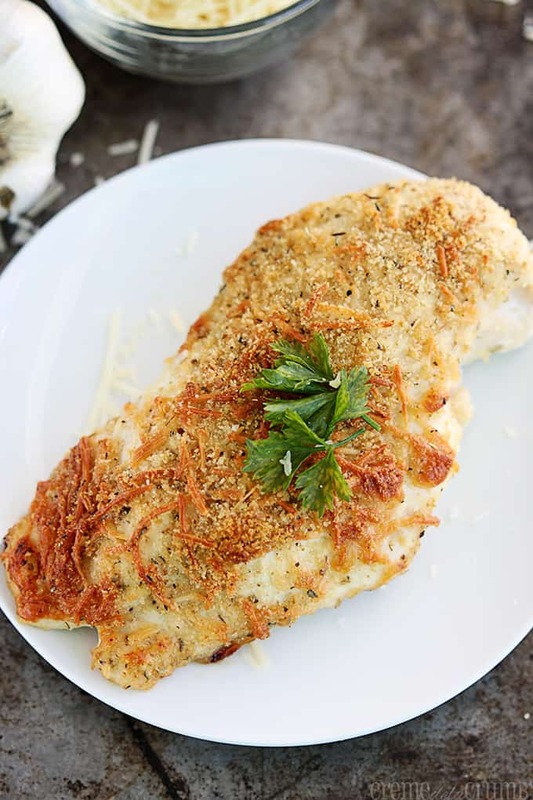 Garlic Parmesan Chicken – Savory baked garlic chicken topped with parmesan cheese! Easy, delicious, and comes together in just 35 minutes! Is it really mid-December already? Stop it right now, I’ve had enough of this fly-by season thing. I’m tired but too scared to take a nap for fear I’ll miss Christmas altogether, wake up and it’ll be 2014 already. I made a Fall bucket list this year because I’m sick of getting to the tail-end of a season and realizing I’ve done of the things I look forward to doing during that time of year. The Fall list was actually quite effective and I’m putting together a Winter version. Any thoughts on what I might include? Making a snowman is at the top, obviously, but I need a few more ideas. 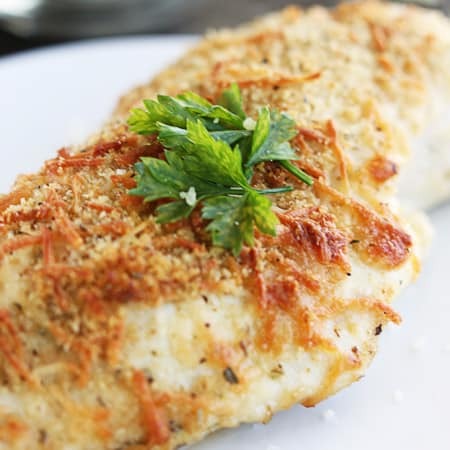 This Garlic Parmesan Chicken is so good! It’s perfect for a quick weeknight fix to get you past that wednesday slump, or you can dress it up for a fancy weekend treat! 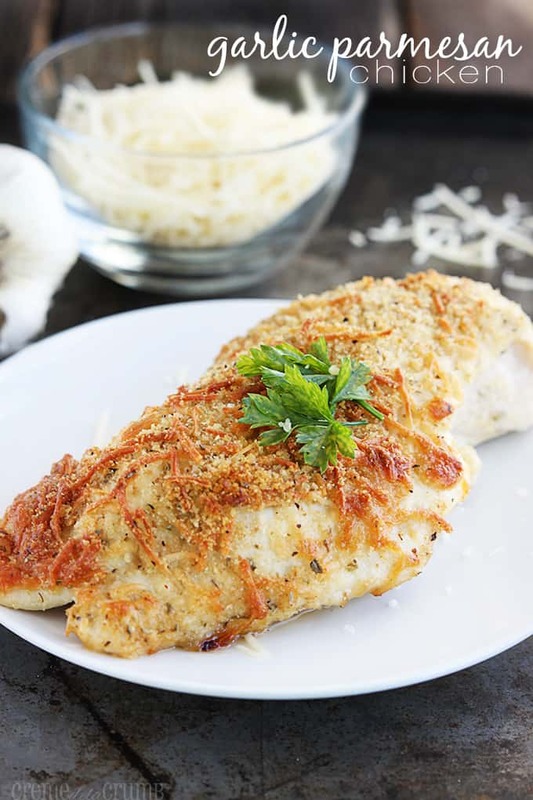 I love the flavors of this juicy chicken… savory garlic and parmesan! The house smelled so yummy when I made this chicken, I’m thinking of inventing the first ever garlic parmesan scented candle just so I can enjoy it every single day. Savory baked garlic chicken topped with parmesan cheese! Preheat oven to 425 and spray a shallow baking dish with cooking spray. Season chicken breasts with salt and pepper, set aside. Warm garlic and olive oil over in the microwave or on the stove 3-4 minutes, until fragrant. Place mixture in a wide bowl. In another bowl combine bread crumbs, parmesan cheese, Italian seasoning, and garlic powder. Dip chicken breasts in olive oil mixture and turn to coat both sides. Next, dip chicken into breadcrumb mixture and toss to coat. Place chicken breasts side by side in baking dish. Bake 15-25 minutes until chicken is cooked through and juices run clear. This sounds amazing! How long would you need to cook it if you were going to use chicken tenders instead of chicken breasts? I would try 15-20 minutes for chicken tenders! That looks delicious! Quite possibly my chicken dish for this week. And could you hurry with that candle? I’m pretty sure I’d buy several from you! I made this for dinner the other night and my husband and I both loved it! It was so full of flavor, and so quick and easy to make. This is definitely going into our regular rotation. Thank you so much for the recipe! Can you use garlic powder instead of minced garlic? Although I haven’t tried it myself, I bet it would taste great with garlic powder in place of the garlic! I would add a little more parmesan to help get a good amount of flavor in there if you do though! I just came across your blog through Pinterest and have pinned AND bookmarked soo many recipes! I, like you, was never one to cook in the kitchen, or anything I did cook never turned out too well. Now that I’m getting older, I’m definitely trying to cook more and perfect at least a few recipes so that I can at least have a go-to dish, when necessary lol. I just have one question about this recipe though: what would you serve it with? Any sauce or dip? I made something similar previously but it was just so blah and I felt my boyfriend didn’t enjoy it too much because it was just that- blah. Thank you and keep blogging so you can help out all of us who need it! Do you know how many carbs are in this dish? Hi Sandi, I do not know the nutrition statistics for this dish but I recommend using http://www.myfitnesspal.com – it’s a great resource! This looks awesome! But what kind of bread crumbs dud you use? Japenese or Italia panko? And do you cut the chicken in half? How do you think this would go with fresh breadcrumbs? And using fresh/crushed garlic right through instead of using garlic powder? 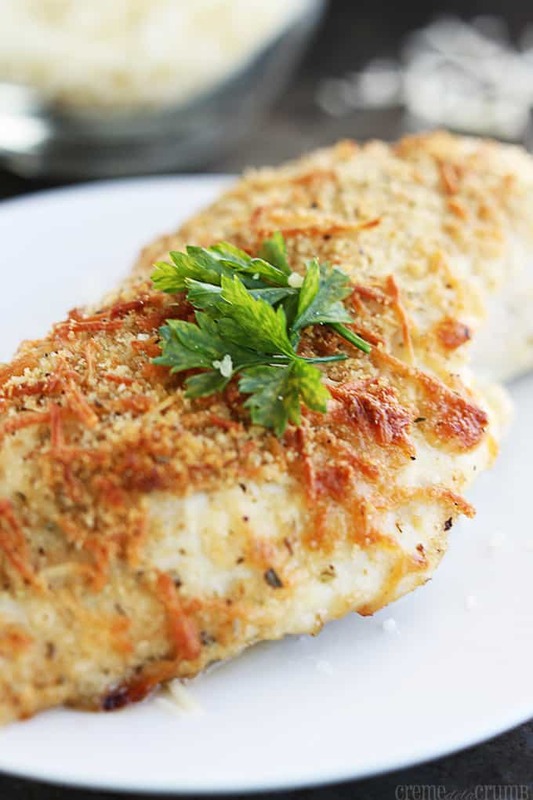 This is the best recipe for garlic parmesan chicken out there. I just moved to America and I didn’t know what Italian seasoning was, so I got Italian dressing and seasoning mix instead and the chicken came out delicious. I tried it again later with actual Italian seasoning only and it wasn’t as good, not even close. Now I always add both to the mix and it’s one of my favorite dishes. I love to serve it with veggies and a side salad!